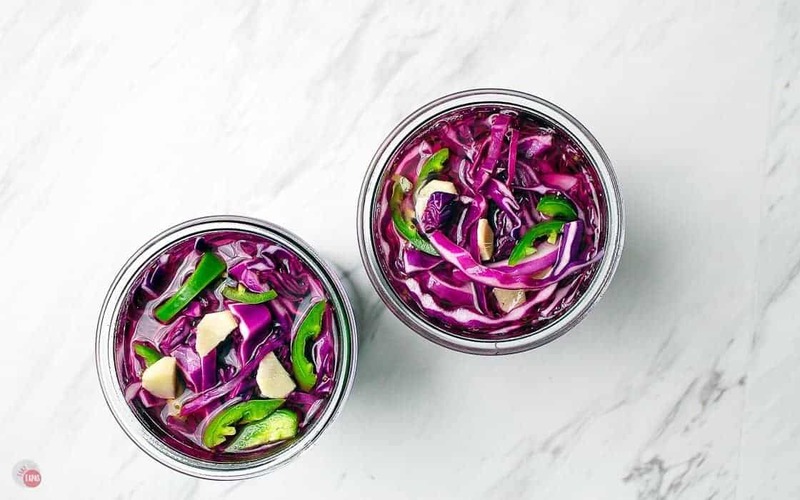 Pickled red cabbage is perfect for a variety of dishes! This tart and spicy condiment is quick to make and keeps in the refrigerator for a few weeks if it lasts that long! Cabbage seems to get a bad rap. Everyone complains that it is smelly, hard to cook, and the kids say they hate it more than broccoli! Me, I love it! Especially the purple cabbage. It lends a nice pink color to dishes and has a subtle flavor. I usually do a quick sauté with a touch of balsamic vinegar for a side dish for dinner. 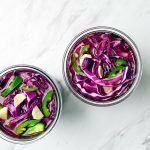 In trying to find new ways to incorporate veggies in my diet, I wondered about pickled red cabbage? In planning a recipe, I was looking for the perfect topping for it. The only thing that came to mind was red cabbage! The color and crispness were exactly what I was looking for. Wanting a hint of tartness to round out the recipe, I thought pickling the cabage would be the best way. Keep reading to see how it turned out! Just take me to the Pickled Red Cabbage Recipe Already! 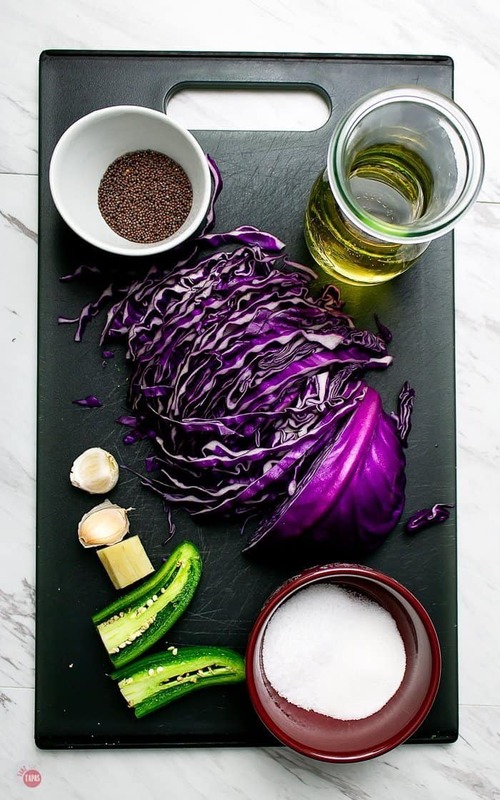 If you’d rather skip my (very helpful, I think) tips and tricks, essential cooking info, and similar recipe ideas – and get straight to this delicious easy pickled purple cabbage recipe – simply scroll to the bottom of the page where you can find the printable recipe card. Oh, but let me tell you! Not only does it have less than 20 calories per half cup serving, but it is full of vitamins, minerals, and compounds that help guard against the effects of radiation, it may also help guard you from cancer*. Cabbage is also great for helping with digestion and fermented versions like sauerkraut have tons of probiotics. It is said that the purple cabbage has a powerful antioxidants!! You better start eating more of it pronto. Purple and red cabbage are the same they just vary in depth of color based on the acidity of the soil so don’t stress about that! Just know that cabbage is good for you. Red cabbage has 10 times more Vitamin A than green cabbage and double the iron. Not only does the cabbage have plenty of health benefits, it tastes great, has a beautiful color that pops when added to recipes, and is hearty enough to stand up to various types of cooking. I love to serve it roasted in wedges, chopped up in slaw, and pickled! Now that I have made this quick pickled red cabbage, I keep finding uses for it. I just might put it on my next cheese board! Or how about my pickled red onions? What would you eat with pickled red cabbage? A: If you keep it stored in the refrigerator, it will last for up to two weeks. But mine always gets eaten before then! Q: Can I use green cabbage? Q: Can I add my own favorite spices to the recipe? A: Feel free to play around with the flavors, herbs, and spices that you and your family like. I use these because they pair well with the dishes we typically serve. Q: What if I don’t have rice wine vinegar? A: Feel free to use any vinegar you might have on hand like white, red wine, or white wine. I wouldn’t use balsamic or apple cider vinegar because their flavors are very strong and will overpower the cabbage. Making pickled cabbage is just as easy as making my pickled red onions. Shave or shred the cabbage thin and place into your storage jars. I like mine spicy and tangy so I layer in some fresh ginger root, peeled garlic cloves, mustard seeds for texture and pop, and some jalapeño slices for heat. Bring the pickling liquid to a boil, boil for a minute or two, and then carefully pour over the cabbage and spices. Let cool, cover, and store in the refrigerator. I like to wait at least 24 hours before using the cabbage so it has time to infuse with all the vinegar and spices. 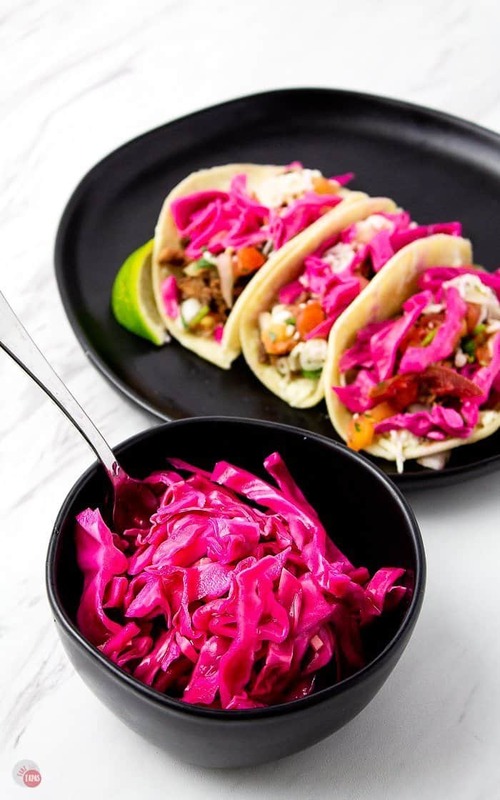 This pickled cabbage is perfect on tacos, burgers, and adding to slaw! Other great red cabbage recipes recipes to try! 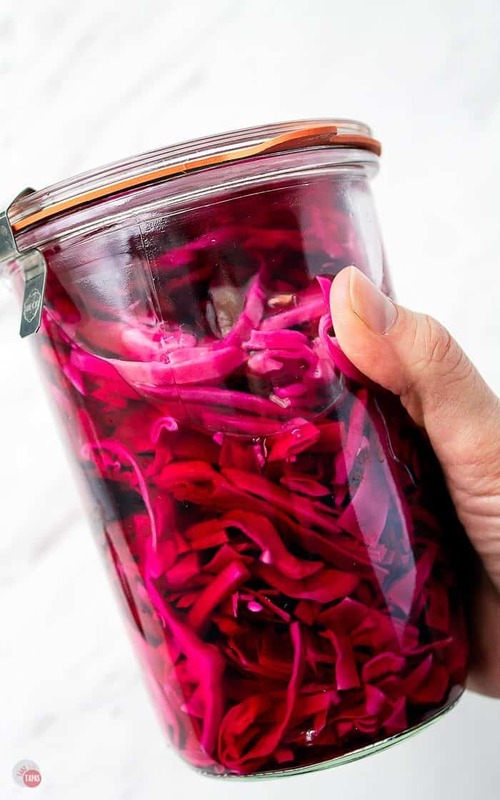 If you love this Pickled Red Cabbage Recipe as much as I do, please write a five-star review in the comment section below (or on Pinterest with the “tried it” button – you can now add pictures into reviews, too! ), and be sure to help me share on facebook! Place the sliced cabbage, ginger root, mustard seed, garlic clove, and jalapeño in a glass jar. Heat the vinegar, sugar, and salt in a saucepan until boiling. When the vinegar is boiling, gently pour over the cabbage and spices. Cover and keep in your fridge for up to two weeks. Delicious. The rice wine vinegar gives it a lighter flavor than cider apple vinegar and the ginger makes it super refreshing and healthful! Thank you for sharing. We raised some red cabbage last summer and I found your recipe on Pinterest. 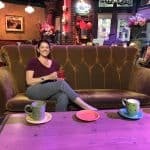 My husband and I are both crazy about it. I’m making more today! It keeps way longer than 2 weeks in the refrigerator. I’ve kept some that we’re using since last September and it is still wonderful! Thanks for sharing! Sue, thank you so much for letting me know! I love hearing that people used my recipe and keep using it over and over again. I have had my cabbage last longer but usually because I forgot it in the back of my fridge. I tend to eat mine pretty quick as I eat so many tacos and love to eat the cabbage in them. I do the same with my pickled red onions. I recently used my pickled red onions in my chimichurri sauce and it added a nice kick to it! You can keep it in the fridge for a few weeks after you pickle it and slowly use it up! I LOVE pickled red cabbage! It’s so tasty on tacos and burritos! I’m totally pinning this so I can give it a try! Thanks Paige! I love to keep a jar of this and a jar of pickled red onions too! I’m not a massive fan of cabbage, but my partner is. If I made this for him, I think he’d love me forever! Keep it in your back pocket when you need a favor! Nothing wrong with that! I also like to add some balsamic vinegar to mine too and it makes it darker! I love cabbage too, and this is so pretty with the red cabbage. Really nice! Thanks Meredith, I love the way it pops too! I think it adds the pickle kick AND the visual boost! Ooh! I will have to try it with mashed potatoes! That sounds intriguging! Thanks Sina! I hope you like it! Yum! How can something so simple look so deliciously tempting? I want this in my life — plus I have a weakness for red/purple. 🙂 So please enter my life cabbage, I need you! Grab a head and make some! Just takes a few minutes! I am putting on my eggs in the am! Beautiful. This would go well with….. anything really. Love love love pickled stuff. Thanks! It’s good on so many things! I like it on eggs and chicken too! This looks so amazing, I love this stuff on sandwiches and pulled meat too. The colour just pops. I will have to put it on sandwiches next time too! Thanks Susan! I am going to put it on just about anything! I knew we were kindred spirits when I tasted your caponata! Pickled cabbage is great on eggs to I have found out recently! I’ve got a whole head of red cabbage I was feeling uninspired about. This is a great and gorgeous idea. Thanks. Chop it up and pickle it! You can ue it for anything!! I’ve always wanted to try a homemade pickle! 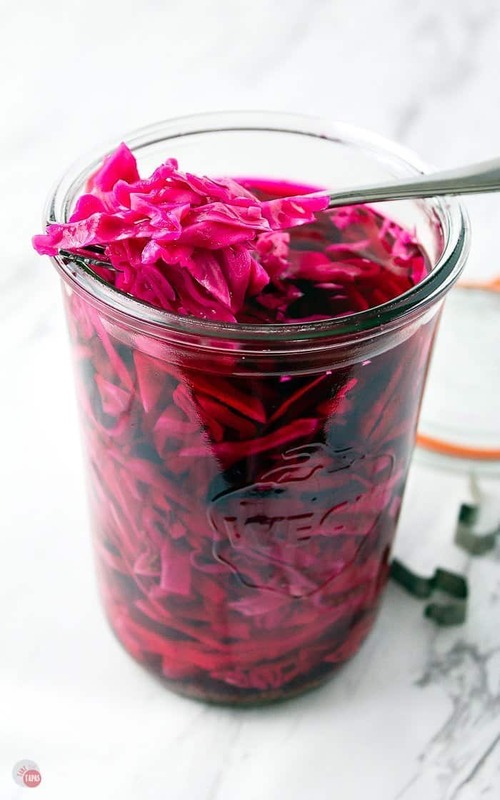 This pickled red cabbage looks like the perfect side to any fall dish; loving the color too!! Thanks so much! Definitely going to try this with my turkey this year! Beautiful! Not to mention delicious – love pickled cabbage! It’s so pretty! I bet it would be great on tacos! Thanks Lauren! I love putting mine on eggs too! I love short ribs so I will have to hop on over to your blog and check out that recipe!